We ran the stream benchmark on SUSE SLES 11. The stream benchmark produces 4 numbers: copy, scale, add, triad. Triad is the most relevant in our opinion, it is a mix of the other three. The new DDR3 memory controller gives the Opteron 6100 series wings. Compared to the Opteron 2435 which uses DDR-2 800, bandwidth has increased by 130%. Each core gets more bandwidth, which should help a lot of HPC applications. It is a pity of course that the 1.8 GHz Northbridge is limiting the memory subsystem. It would be interesting to see 8-core versions with higher clocked northbridges for the HPC market. Also notice that the new Xeon 5600 handles DDR3-1333 a lot more efficiently. We measured 15% higher bandwidth from exactly the same DDR3-1333 DIMMs compared to the older Xeon 5570. The other important metric for the memory subsystem is latency. Most of our older latency benchmarks (such as the latency test of CPUID) are no longer valid. So we turned to the latency test of Sisoft Sandra 2010. With Nehalem, Intel increased the latency of the L1 cache from 3 cycles to 4. The tradeoff was meant to allow for future scaling as the basic architecture evolves. 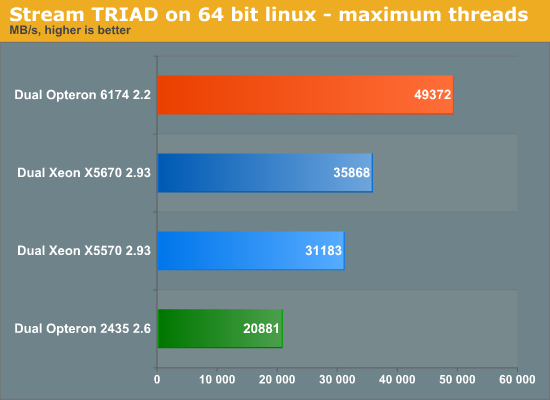 The Xeons have the smallest (256 KB) but the fastest L2-cache. The L3-cache of the Xeon 5570 is the fastest, but the latency advantage has disappeared on the Xeon X5670 as the cache size increased from 8 to 12 MB. Interesting is also the fact that the move from DDR2-800 to DDR3-1333 has also decreased the latency to the memory system by about 15%. There's nothing but good news for the 12-core Opteron here: more bandwith and lower latency access per core. You stated "... that kind of bandwidth is not attainable, not even in theory because the next link in the chain, the Northbridge ...". Why don't you add STREAM and LINPACK to your benchmark suites? These are very important benchmarks for HPC. For last few days I did several tests with Swingbench CC with similar database configuration but I achieved a bit different results, I’m just wondering what exactly settings you put for CC test itself. I mean about when you generate schema and data for that test? Thanks for answer. Hyperthreading is always on. But we will follow up on that. A VDI based hypervisor tests is however not immediately on the horizon. The people of the VRC project might do that though. Google on the VRC project.